The Training Lab (130) is a computer lab on the first floor of the Hurley Convergence Center available to UMW students, faculty, and staff. This room can be reserved for training sessions and occasional class meetings. When the room is not scheduled it is available for use as an open computer lab anytime the HCC is open. 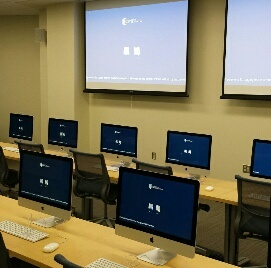 The room contains 16 student computers and one instructor computer connected to a dual-projection AV system. The computers are all "dual boot" allowing you to use either the Windows or Apple OSX operating systems. IMPORTANT: All users must have a working UMW NetID and Password and login to use the machines in this lab. Reservations must be made at least 24 hours in advance, and require review and approval before booking is complete. For more information about reserving the HCC Training Lab, please contact the Help Desk at 540-654-2255 or helpdesk@umw.edu.